I know truffle anything may sound hoighty toighty, fancy schmancy pants, and over the top…BUT…it’s a totally approachable flavor at home. I used to be intimidated by truffle myself – in fact, the very first time I tried cooking with it, I ruined the meal. It was intended to be a pizza with a truffle essence…and I, not realizing just how potent truffle oil is, heavily drenched the entire pizza with it. Ugh. It was gross. We had to throw it out. Sad face. Hopefully I didn’t just discourage you. Because despite that, I decided to try the truffle thang out again…with much success. I have not grown tired of the truffle trend, and I think investing in a bottle of truffle oil can take you a loooong way. You only need a drizzle here and a drizzle there! (I’m still sad about that pizza, though. Sigh.) Don’t be scared. Embrace the truffle. I’ve served this dish to several people, and many times they ask for the recipe. It’s that good. 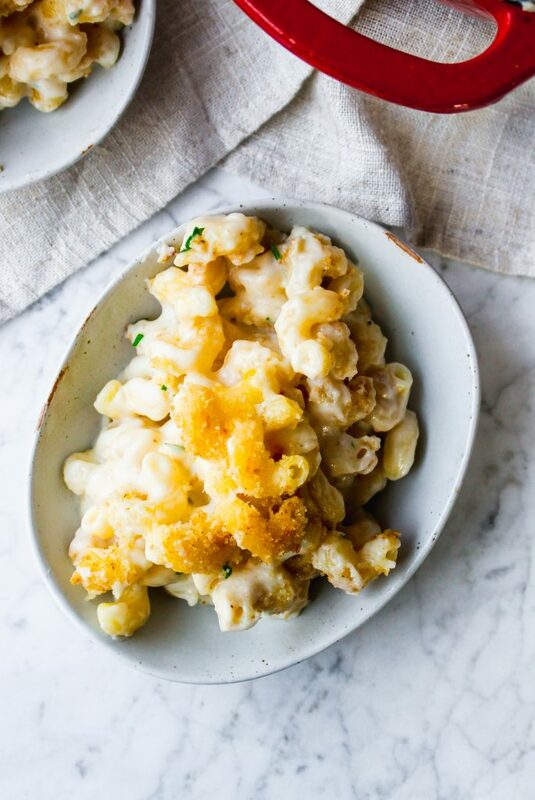 Creamy, cheesy, earthy, and everything else we all love about mac-and-cheese. Save this one for a special occasion, but definitely give it a shot. It’s so worth it. 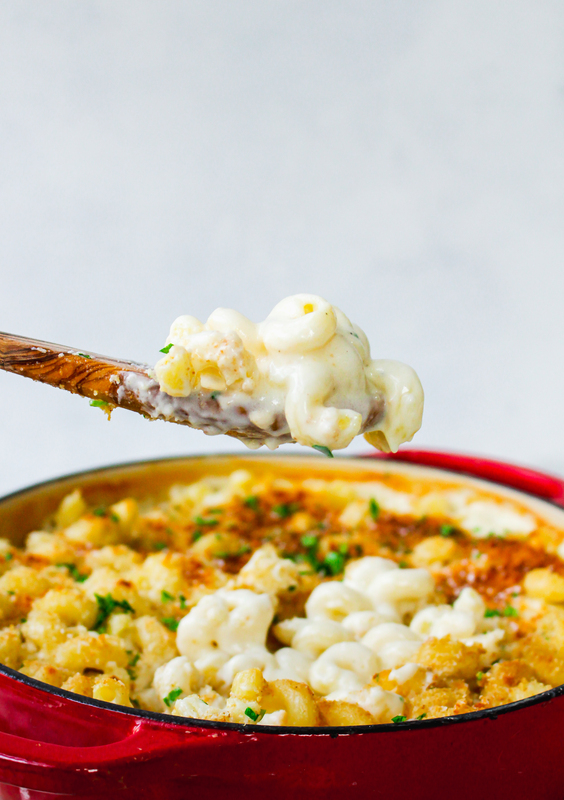 Just look at that gooey, creamy cheeeeeese….. need I say more? Like I said, embrace the truffle. Truffle is your friend. Repeat after me… Truffle is my friend. Truffle is my friend. Truffle is my friend…. Now go make this mac! You won’t regret it! Bring a large pot of salted water to a boil and preheat the oven to 375°F. Butter a 9 x 13-in baking dish. Melt the butter in a large saucepan. Grate in the garlic and cook for 30 seconds. Add the flour and cook until lightly golden. Whisk in the half-and-half and bring to a simmer. Whisk frequently and cook over medium-low heat until thickened. Cook the pasta for 6 minutes (it will be very el dente). Drain completely. Add in the cheeses to the sauce and whisk until melted. Drizzle in truffle oil and taste to make sure it’s truffle-y enough. 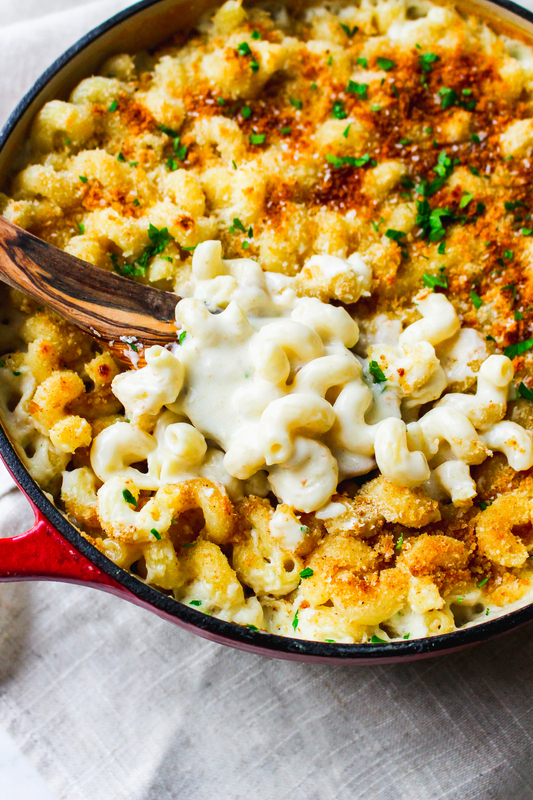 Toss the pasta with the cheese sauce and then transfer to the buttered baking dish. Melt the truffle butter in a small saucepan and season with salt. Toss the panko breadcrumbs in the melted butter and then spread in an even layer over the mac and cheese. 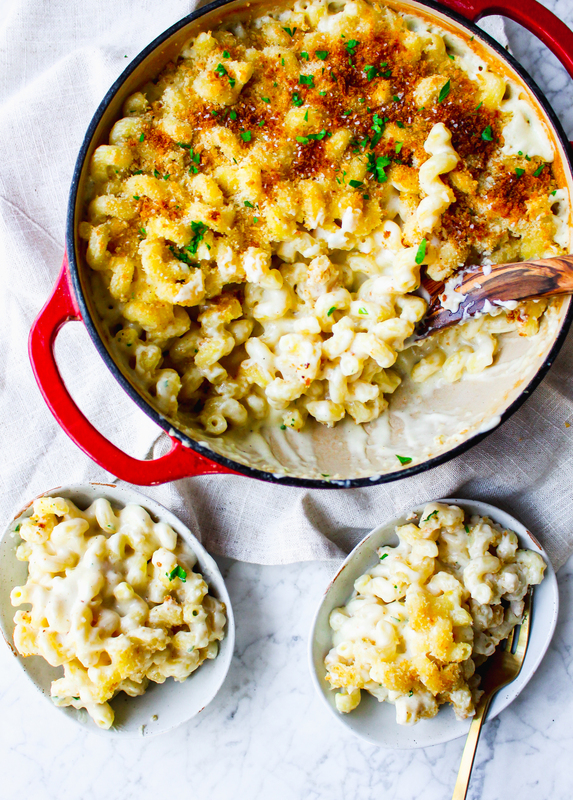 Bake for 20-25 minutes or until the top is golden and the cheesy is bubbly. Allow to cool slightly. Drizzle the top with more truffle oil, if desired, and garnish with chopped parsley. Serve warm. I’m loving your blog. You are SO talented. You’ve convinced me to but truffle oil, which I don’t have, and have never tried! Aww thanks so much! I very much appreciate it. You should definitely get some…it’s great stuff! Black or white truffle oil? I’m thinking this would be an impressive Thanksgiving side dish! Is the truffle butter necessary in addition to the truffle oil? If yes, do you know what else I can use for truffle butter? And if I can find these items at Whole Foods..? Thanks so much for your help in advance! Hi Joanne, you can probably get away with the truffle oil and regular butter. Just drizzle some extra oil in the mix. You can probably find it at WF but I haven’t tried there. The link at the end of the recipe is a good bet! 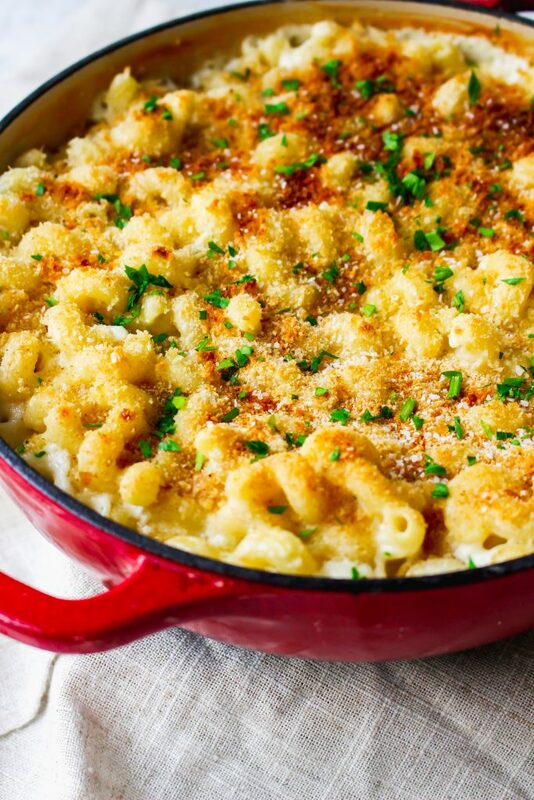 O.M.G… I just made this for Thanksgiving last night and it was a HUGE hit!! It was probably the best thing I’ve ever made in my entire life. SUPER DELICIOUS!! Followed this recipe exactly, except I needed to add more truffle oil since it wasn’t good quality truffle oil (got it from Trader Joe’s). I had to add 5 teaspoons. That is awesome to hear! I’m so glad you loved it. It’s definitely one of our favorite things in the world! Truffle products can be tricky, too, which is why I always think seasoning it “to taste” is the best way to go. Thanks for the comment! Absolutely Scrumptious! I actually used 4 ounces each of the Gorgonzola and the Goat cheese, as well as Heavy Cream instead of half and half. As far as I am concerned, the more truffle butter and truffle oil the better, yum! Lynn, sounds like your version would be extra delicious! So glad you enjoyed the recipe! Hi Molly. This sounds delicious. I will make this today but I wanted to know if I can follow all steps and then place it in the fridge and cook it Saturday night? Will it still be good? I want to thank you for the recipe. I made it for thanksgiving and it came out great. I increased some portions for a larger group and it worked out just fine. I also used different cheeses, the cheese shop that I went to specialized in American cheeses so they didn’t have the Italian cheeses but they had very good substitutions. For the goat cheese I used a Kunik cheese (cow / goat cheese blend), for the Gorgonzola I used a Bay Blue cheese, for the Fontina I used a Reading Raclette and they did have an American Parmesan so that worked out well. I think I added too many bread crumbs but all in all it turned out well. Thank you. So glad you enjoyed it! It’s one of my favs! Are the cheese amounts by volume or weight? Are the cheese amounts by weight or volume ? Hi, does anyone know if this can be prepped ahead of time? I’d like to make this for thanksgiving but would need to do most of the prep at my house and then take it to the inlaws and cook right before dinner. Thanks! Hi Andrea! I’m sorry I didn’t see this question sooner. Yes, you can definitely sub the oil for the butter! Hi !so I am so excited to try this recipe for tomorrow’s feast and I made a few grocery trips to accommodate this recipe. A heads up WF (whole foods )carries all the ingredients, truffle butter, truffle oil and the cheese’s. If you live in Los Angel fontina cheese may be tuff to get you’re hands on I am going to use gureyre, let’s see how it goes. I also found all the cheese’s and for a reasonable price at my local walmart neighborhood market. However my question to you is o didn’t purchase the truffle oil because I had seen it was $34.99 @ WF and this is the first time I use it but I did purchase the black truffle butter $10.99@ WF will I be able to use EVOO? Hi Michelle! You can use the butter only. If you want to sub out the truffle oil (which is understandable given its price), just do so in the crumb topping. I wouldn’t add EVOO to the sauce part because I think it might make it too greasy? Unfortunately, most of the truffle flavor comes from the oil, so you may not get the same truffle explosion taste. You’ll still get some from the butter, though. The price is part of why I save this dish for special occasions! Hope this helps! Mine was delicious but seemed a little dry. What could have went wrong? Hmm, not sure! It may depend on the type of pasta you use. Try rinsing the pasta off before tossing it with the sauce next time. Getting rid of that extra starch may solve the problem. Did you happen to get the idea from Barclay Prime? 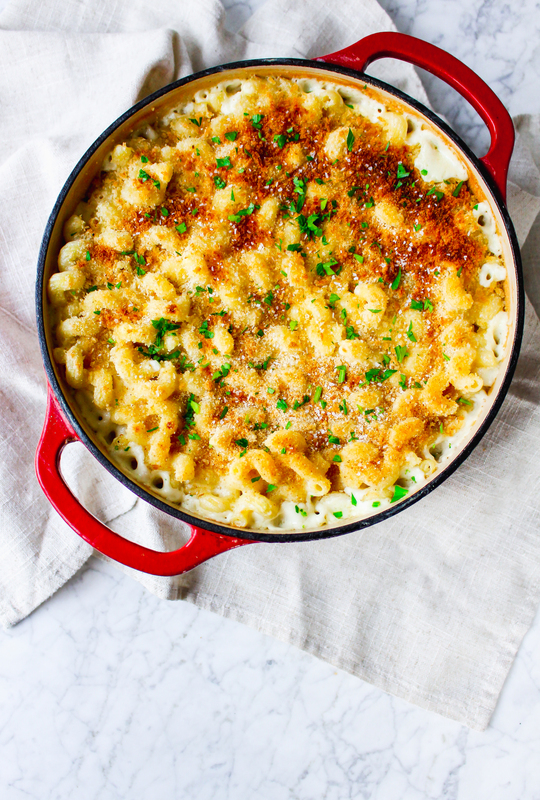 Their truffle Mac and cheese is so good and my friends and I were looking for a recipe! Yes! 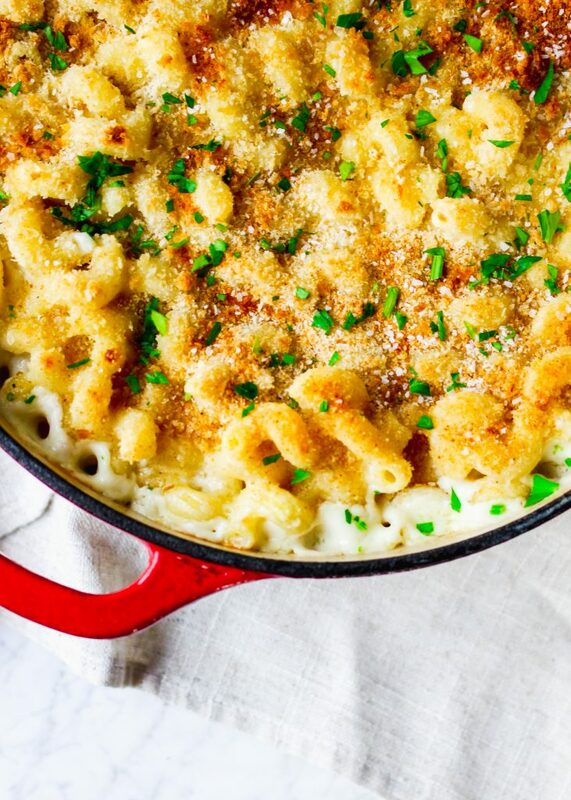 It’s our absolute favorite and was definitely the inspiration for this recipe. I totally guessed how to make it, and while I can’t claim that it’s as good as Barclay’s, it is darn delish. Let me know if you give it a try! Just finished eating the recipe and it was great! Thanks for coming up with this. It’ll definitely become a staple at my house! I love this recipe and have made it multiple times for different occasions! I want to make this for a work potluck coming up, but my problem is that I’d have to make it the night before, refrigerate it overnight, and then microwave it at work the next day… would it still turn out if I did it this way? I am SO glad to hear you love this recipe, Cassie! It’s definitely one of our favs. As for your question, I actually am unsure. We never have leftovers either! That said, we have reheated other mac and cheese leftovers with good results. I just don’t know that I’ve ever served them to other people that way. I’m sorry I’m not more help. Perhaps another reader will know better! Some of my family felt the same as you about the bleu. So the FIRST time I prepared it-I substituted gruyere. It was yummy. The dish was such a hit that I made it a second time during the holidays-this time I used the gorgonzola and EVERYBODY loved it-the bleu is not off-putting or yucky-even if you aren’t a fan.